Those who wish to capitalize on VoIP technology have more than once wondered how promising traffic termination in Jordan is. According to entrepreneurs, this country has quite favorable conditions to run a business in this industry. Of the 7 million 734 thousand inhabitants, almost 78% is the urban population, due to the climatic and terrain conditions in the country. For this reason, the increase of urbanization in the Jordan amounted to 3.1% in recent years in relation to the total population. This is quite a high rate, which has a definite impact on the telecommunications market. Due to the urbanization of the population, the mobile penetration is increasing in the country. Terminators should consider that in Jordan, out of a total population, GSM users account for 95%, and 47% for the Internet. For example, 22.5 computers are accounted a thousand people in Jordan. According to the tourists, the country has virtually no place, except for the desert, where there is no connection available. Many terminators keep coming to the conclusion to buy GoIP and install in in Jordan, especially in big cities like Zarqa, Amman, and Irbid. Throughout the country, the VoIP-devices function without interruptions and freezes. They only need to be connected and correctly configured. 3 mobile operator in Jordan - Umniah, Zain and Orange – provide an excellent level of communication. A large part of the territory and users belong to Umniah. According to the 2015 data, Umniah services are used by 3.2 million subscribers. World-renowned operators Zain and Orange account for approximately 2 million users. For this reason, originator companies’ requests for GSM termination in Jordan can often be found on the forums. Transit operators offer impressive amounts of traffic to terminate via the route - from 20 to 50 thousand minutes. Termination in such volumes will provide a good profit even at the beginning, especially if you use the Umniah packages. 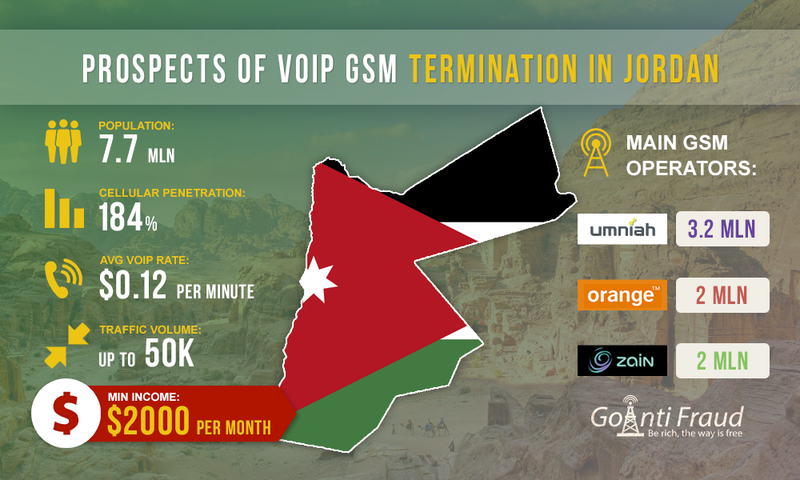 The average cost of VoIP minute in Jordan is $0.12, while the tariff for local calls is about $0.08. Based on the above data, the average earnings of the terminator in a month in Jordan could be about $2,000 from only one channel of the VoIP-equipment. And if you install a multi-port GoIP that has 8, 16, 32 channels, the profits will be even greater. To run a successful business, it is important to consider such a question as the VoIP gateway setting, as well as to protect your SIM-cards against the lock by antifraud systems.